To evaluate the association between induced abortion (IA) and breast cancer risk among Chinese females. We searched three English databases (PubMed, ScienceDirect, and Wiley) and three Chinese databases (CNKI, WanFang, and VIP) for studies up to December 2012, supplemented by manual searches. Two reviewers independently conducted the literature searching, study selection, and data extraction and quality assessment of included studies. Random effects models were used to estimate the summary odds ratios (ORs) and the 95 % confidence intervals (CIs). A total of 36 articles (two cohort studies and 34 case–control studies) covering 14 provinces in China were included in this review. Compared to people without any history of IA, an increased risk of breast cancer was observed among females who had at least one IA (OR = 1.44, 95 % CI 1.29–1.59, I 2 = 82.6 %, p < 0.001, n = 34). No significant publication bias was found among the included studies (Egger test, p = 0.176). The risk increased to 1.76 (95 % CI 1.39–2.22) and 1.89 (95 % CI 1.40–2.55) for people who had at least two IAs and at least three IAs, respectively. Subgroup analyses showed similar results to the primary results. 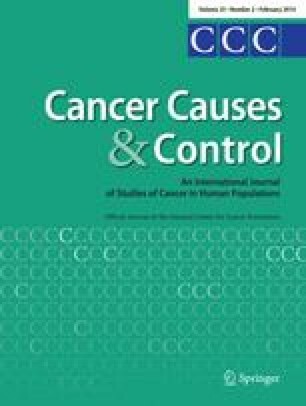 Meta-regression analysis of the included studies found that the association between IA and breast cancer risk attenuated with increasing percent of IA in the control group (β = −0.022, p < 0.001). The online version of this article (doi: 10.1007/s10552-013-0325-7) contains supplementary material, which is available to authorized users. This work was supported partially by the National Natural Science Foundation of China (Grants 81172762), program for Changjiang Scholars and Innovative Research Team in University in China (Grant IRT1076), National Key Scientific and Technological Project (Grant 2011ZX09307-001-04), Tianjin Science and Technology Committee Foundation (Grants 09ZCZDSF04800, and 09ZCZDSF04700), Tianjin Science and Technology Committee Foundation (Grants 12ZCDZSY16000, and 11ZCGYSY02200), and Major State Basic Research Development Program of China (973 Program, Grant 2009CB918903).